MANHATTAN DisplayPort Male to VGA Female Converter Cable 6"
The Manhattan DisplayPort to VGA Converter helps establish a fast, simple and convenient link between newer DisplayPort-equipped desktop or notebook computers and other media sources with existing VGA monitors. 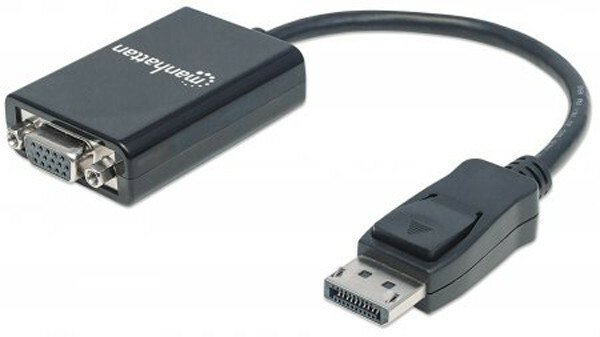 This converter is easy and quick to install and requires no complicated configuration or setup to help extend the service life and value of legacy VGA displays, projectors and other equipment. This low power, cost-effective and reliable solution allows PC users to transition to DisplayPort bandwidths, resolutions, Deep Color and more without the expense of upgrading to newer and costly monitors and projectors. Its integrated, all-in-one design eliminates unnecessary cables, tangles and clutter to keep installations and workspaces neat and orderly.